Vehicles travel on I-76 near University City as the snow falls during Winter Storm Toby on Wednesday, March 21, 2018. The second part of the winter weather doubleheader will be here soon enough. So what to expect from this significant storm? The National Weather Service in Mount Holly says the forecast is complicated as far as timing and precipitation type. And that results in a large measure of uncertainty regarding aspects of the short-term weather picture. First off, a winter weather advisory remains in effect for the region – from Doylestown to New Castle County and from West Chester to Atlantic City – until noon Tuesday. The weather service has now upgraded the advisory to a winter storm warning for western Montgomery County as well as Berks County, Upper Bucks County and Lehigh County that will not expire until 11:59 p.m.Tuesday. The snow arrives from the south this evening into Philadelphia, its suburbs as well as South Jersey, and spreads northward into Central New Jersey by or after midnight, forecasters said. The snow could be moderate to heavy initially, with as much as three inches of snow in the city and four inches possible in Doylestown, and a light accumulation of ice in many areas. As much as seven inches of snow is possible in western Montgomery County and Upper Bucks County. Warmer air looks to effect a changeover to sleet and/or freezing rain late Monday night and Tuesday morning near or north of the I-76 corridor. South of that line, the precipitation will be mostly rain. A wintry mix will spread rapidly to the north during the morning hours, and may linger through early Tuesday afternoon (at the least) near and especially west of the Philadelphia metro area, forecasters said. Eventually, warmer air looks to surge far enough to the north in the afternoon to displace cold air south of the Pennsylvania Turnpike. But forecasters noted that timing differences in the expected transition of only 2-3 hours could nearly double or halve the anticipated snow totals. Obviously, the snow-sleet-freezing rain-rain could impact the Monday night and Tuesday morning commutes. 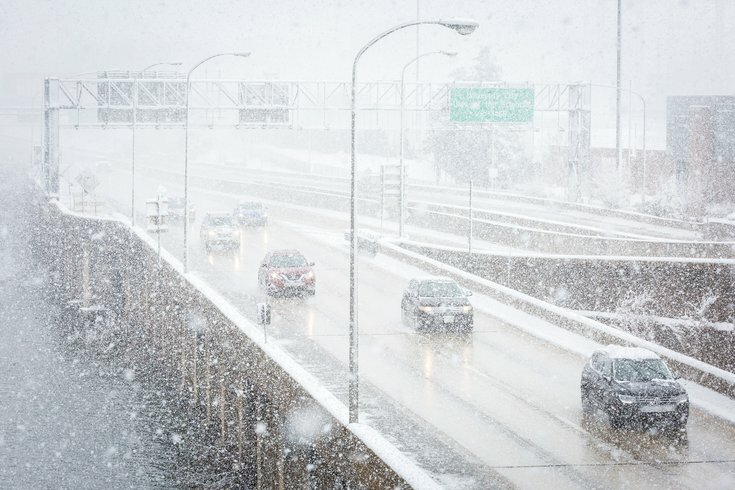 Forecasters said to expect slippery conditions on area roadways during that period. The precipitation moves away quickly Tuesday night, and strong winds (gusting perhaps at 45 mpg) could move in Wednesday. That said, it's looking like a wet week ahead and into next weekend. Monday afternoon: A chance of snow. Cloudy, with a high near 36. Light east wind. Chance of precipitation is 30 percent. Total daytime snow accumulation of less than one inch possible. Monday night: Snow and sleet likely before 10 p.m., then snow likely between until 2 a.m., then snow, freezing rain and sleet afterwards. Low around 30. East wind 5 to 9 mph. Chance of precipitation is 90 percent. Little or no ice accumulation expected. New snow and sleet accumulation of 1 to 2 inches possible. Tuesday: Snow, freezing rain, and sleet before 8 a.m., then rain, freezing rain and sleet until 2 p.m., then rain after 2 p.m. High near 42. East wind 11 to 15 mph. Chance of precipitation is 100 percent. Little or no ice accumulation expected. New snow and sleet accumulation of less than one inch possible. Tuesday night: Rain. Low around 35. East wind 5 to 11 mph becoming west after midnight. Chance of precipitation is 90 percent. New precipitation amounts between a half and three quarters of an inch possible. Wednesday: A chance of rain before 8 a.m., then a slight chance of showers between until 2 p.m. Partly sunny, with a high near 41. Breezy, with a west wind 13 to 20 mph, with gusts as high as 38 mph. Chance of precipitation is 30 percent. New precipitation amounts of less than a tenth of an inch possible. Thursday: Mostly sunny, with a high near 47. Thursday night: Mostly cloudy, with a low around 35. Friday: Rain likely between 8 a.m. and 2 p.m., then showers likely afterwards. Cloudy, with a high near 54. Chance of precipitation is 60 percent. Friday night: Showers likely. Cloudy, with a low around 42. Chance of precipitation is 70 percent. Saturday: Showers likely. Partly sunny, with a high near 50. Chance of precipitation is 60 percent. Saturday night: A chance of showers. Partly cloudy, with a low around 29. Chance of precipitation is 30 percent.